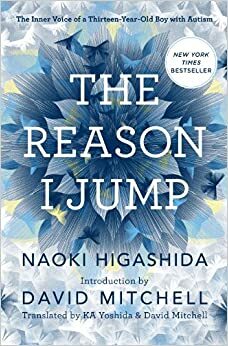 The Reason I Jump is the first book of its kind: a first-person account of the experience of autism written by an autistic 13-year-old boy. Reading it, I was impressed by how the struggles he has are the same as everyone else’s, but how much more in-tune he is with the discomfort that he causes others. For instance, his answers to questions like “Why do we have to tell you things over and over?” or “Why don’t you remember what we’ve told you” almost always include a plea to “stick with me” after attempting to explain why he does something incomprehensible or irritating. I could see him struggling to be understood, realizing that the things he did irritated people and feeling despondent because of how these things affected those around him. But he couldn’t stop as easily as I can. Despite this — or because of this — he seemed more motivated than I am to figure out how to control his involuntary actions. It left me feeling a little guilty — like how I felt about myself when I heard about the dyslexic lawyer who was motivated to develop ways of learning and remembering that I’ve never even bothered with. Your dyslexic lawyer link broke. Previous Previous post: Let Obamacare fail on its own Merits.